Millennials are quite happy–and even prefer–watching “TV” on laptops or smartphones. We’re all watching more TV content online–to the chagrin of traditional broadcasters. So when this news item pointed out that people were watching more online content on TVs, it caught my attention. Topsy-turvy? Not so fast. The writers explain that “Movies are the most popular source of entertainment for consumers viewing internet content on TVs.” Ah–Netflix and such are the “internet” content being watched on TV’s. Confusing? Where did that Netflix content originate? The article raises interesting questions on changing patterns in viewing, as we further break down the barriers of what is or is not broadcast, narrowcast, internet, TV, movies. Santa Clara, Calif., August 23, 2012 — Consumers increasingly prefer to view online content of their choice, at their own time on their preferred device, according to the new NPD DisplaySearch Connected TV Study: Features, Content and Usage. While the study found that desktop PCs and laptops are still the primary source for viewing online content, mobile devices such as tablets and smart phones are gaining ground. The study found that 18% of consumers surveyed in 14 regions are accessing online content daily on their TV sets. Movies are the most popular source of entertainment for consumers viewing internet content on TVs. Consumers prefer to watch movies in a social setting, and since movies are available via online sites, they have become the most preferred content. Previously broadcast videos programming has also gained consumer attention. This is one of the ways that consumers can catch up on daily programming that they miss at its original time of broadcast, allowing them to view content at their convenience. Among consumers who do not view online content via TV, 44% said they have no interest in viewing that content on their TVs, and about 30% indicated they simply do not own the necessary devices. Of these respondents, if given the possibility of viewing online content on their TV, only a third said they would be interested in doing so. “Although results differ by country, the results imply that there is still a general lack of interest in viewing online content via TV. This can be attributed to usage of devices other than TVs to view online content as well as a lack of infrastructure and/or expertise to connect their existing TVs to the internet,” Patel added. 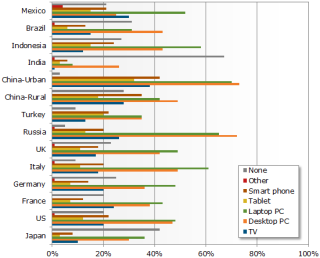 Despite this, daily usage of TVs to view online content remains under 30% in most countries. In fact, online content on TV is viewed most aggressively in China—possibly due to consumer interest in viewing foreign programs that may not be available via traditional TV medium. The NPD DisplaySearch Connected TV Study: Features, Content and Usage is an essential reference for TV and multimedia content companies. The study, which is based on a global survey of more than 14,000 respondents in 14 regions, provides valuable data-driven insights on how consumers view online content, which devices are used for viewing online content, and how frequently they watch online video from providers like Netflix and Hulu. For more information on the report or for further assistance, please contact us at +1.408.418.1900, sales@displaysearch.com, or at the local DisplaySearch offices in China, Japan, Korea, Taiwan, and the UK. Since 1996, NPD DisplaySearch has been recognized as a leading global market research and consulting firm specializing in the display supply chain, as well as the emerging photovoltaic/solar cell industries. NPD DisplaySearch provides trend information, forecasts and analyses developed by a global team of experienced analysts with extensive industry knowledge. In collaboration with the NPD Group, its parent company, NPD DisplaySearch uniquely offers a true end-to-end view of the display supply chain from materials and components to shipments of electronic devices with displays to sales of major consumer and commercial channels. For more information on NPD DisplaySearch analysts, reports and industry events, visit us at http://www.displaysearch.com/. Read our blog at http://www.displaysearchblog.com/ and follow us on Twitter at @DisplaySearch. The NPD Group is the leading provider of reliable and comprehensive consumer and retail information for a wide range of industries. Today, more than 2,000 manufacturers, retailers, and service companies rely on NPD to help them drive critical business decisions at the global, national, and local market levels. NPD helps our clients to identify new business opportunities and guide product development, marketing, sales, merchandising, and other functions. Information is available for the following industry sectors: automotive, beauty, entertainment, fashion, food, home and office, sports, technology, toys, video games, and wireless. For more information, contact us or visit npd.com and www.npdgroupblog.com. Follow us on Twitter at @npdtech and @npdgroup.